When making your own bread, make sure you use strong flour. This is because it contains lots of gluten, which is vital if bread is to rise well. Salt is also crucial, not only for flavour, but also to help the gluten 'set'. Use 1½-2 tsp salt per 500g flour. Measure the flour and salt into a large bowl. Make a well in the centre, add warm water and yeast, and incorporate some of the flour to form a thick batter. Leave for 20 minutes till you have a frothy mixture. This is called a sponge and is formed as a result of the yeast feeding on the flour and releasing carbon dioxide and alcohol (both of which evaporate during baking). Bread gets some of its flavour from this alcohol so giving the yeast this head start deepens the flavour. Some traditional breads are made with sponges that have been bubbling away for days. Mix the rest of the flour and more water into the sponge to form a rough dough. Tip out on to a floured surface and knead. Kneading is key: it develops the gluten in the dough, causing it to form a stretchy network that traps the gas released by the yeast, allowing the bread to rise. 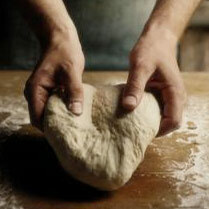 Stretch out the dough with the ball of your hand, fold it over on itself, turning it 90 degrees, then stretch again. Keep going for 10 minutes. It seems like a long time but it will result in smooth, elastic dough. Put the dough in a lightly oiled bowl and cover with a cloth or oiled clingfilm. Leave until doubled in size. This can take up to 2 hours - it doesn't matter as long as the dough doubles. You can even leave dough in the fridge overnight to rise slowly. Some bakers do this to further develop the flavour. Now 'knock back' the dough by punching it in the bowl to release most of the gas, then turning it out and kneading for a minute or two. Flatten the dough into a disc. Fold each side into the centre, pressing along the length of the dough to seal the layers together. Use your thumbs to create an indentation down the length of the dough. This entire process helps to expel large bubbles and distribute the gas evenly within the dough, making an even-textured loaf. Now shape the dough to fit a tin, or fashion into a free-form loaf and place on a heavy baking sheet. Cover and leave to rise again for about 45 minutes. Kneading and rising the dough twice stretches and strengthens the gluten further, making the dough light and evenly textured. Bread needs to be baked in a hot oven, usually 220°C/gas 7, so the gas within it expands quickly before the crust hardens. Brush the dough with water if you want a crisp crust, or oil for a softer crust. Most loaves take between 20 and 40 minutes and are cooked when golden brown and hollow-sounding when tapped. Turn out on to a wire rack and leave to cool. Yeast mixed directly with salt will die, so always mix the salt into the flour before you add the yeast. The amount of water that flour will absorb can vary, depending on the gluten in the flour and the temperature of the kitchen. Add gradually until you have a soft dough. Don't open the oven for the first 15 minutes; you can open it after that if, say, the loaf is browning unevenly and needs turning. Rose Levy Berenbaum's book The Bread Bible (Norton; £25) and Bread by Ursula Ferrigno and Eric Treuille (Dorling Kindersley; £12.99) are both excellent resources for home bakers.